SrIperumbUthUr – purattAsi uthram, amAvASyai, Friday (yesterday) – http://sriperumbuthur.blogspot.com/2016/09/september-2016-week-5.html . SrI bhagavath gIthA – 3rd chapter – SlOkams 36 and 37 added in http://githa.koyil.org/index.php/3/ based on http://githa.koyil.org/index.php/3-original/ . thiruvAimozhi 3.7.4 – udai Arndha – http://divyaprabandham.koyil.org/index.php/2016/09/thiruvaimozhi-3-7-4-udai-arndha/ – English translation. Full series can be viewed at http://divyaprabandham.koyil.org/index.php/thiruvaimozhi/ . thirumAlai – pAsuram 20 – http://divyaprabandham.koyil.org/index.php/2016/09/thirumalai-20/ – English translation by T N krishNan swamy. Full series can be viewed at http://divyaprabandham.koyil.org/index.php/2016/07/thirumalai/ . This entry was posted in Uncategorized on September 30, 2016 by Sarathy Thothathri. SrIperumbUthUr – purattAsi pUram (yesterday) – http://sriperumbuthur.blogspot.com/2016/09/september-2016-week-5.html . thiruvallikkENi – EkAdhaSi, thirumayilai pEyAzhwAr mangaLASAsanam (27th) – http://thiruvallikkeni.koyil.org/?p=478 . SrI bhagavath gIthA – 3rd chapter – SlOkam 35 added in http://githa.koyil.org/index.php/3/ based on http://githa.koyil.org/index.php/3-original/ . dhivya prabandham – thiruvAimozhi 3.7.3 – nAdhanai gyAlamum – http://divyaprabandham.koyil.org/index.php/2016/09/thiruvaimozhi-3-7-3-nadhanai-gyalamum/ – English translation. Full series can be viewed at http://divyaprabandham.koyil.org/index.php/thiruvaimozhi/ . SrIperumbUthUr – purattAsi magam (yesterday) – http://sriperumbuthur.blogspot.com/2016/09/september-2016-week-5.html . SrI bhagavath gIthA – 3rd chapter – SlOkams 33 to 34 added in http://githa.koyil.org/index.php/3/ based on http://githa.koyil.org/index.php/3-original/ . thiruvAimozhi 3.7.2 – ALum paramanai – http://divyaprabandham.koyil.org/index.php/2016/09/thiruvaimozhi-3-7-2-alum-paramanai/ – English translation. Full series can be viewed at http://divyaprabandham.koyil.org/index.php/thiruvaimozhi/ . uththara dhinacharyA – thamizh translation – remaining SlOkams uploaded at http://divyaprabandham.koyil.org/index.php/2015/05/sri-varavaramuni-dhinacharya-tamil/. Uploaded by vEnkatEsh swamy. 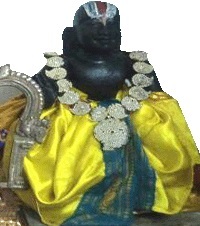 thirunakshathram today – purattAsi (kanni) magam – SrInivAsa guru (kOyil kandhAdai appan) – http://acharyas.koyil.org/index.php/koyil-appan/ . SrIperumbUthUr – purattAsi Ayilyam, EkAdhaSi (yesterday) – http://sriperumbuthur.blogspot.com/2016/09/september-2016-week-5.html . SrI bhagavath gIthA – 3rd chapter – SlOkams 31 and 32 added in http://githa.koyil.org/index.php/3/ based on http://githa.koyil.org/index.php/3-original/ . SrIvaishNava Education/Kids Portal – dhivya prabandham – Most valuable gift from AzhwArs – http://pillai.koyil.org/index.php/2016/09/beginners-guide-dhivya-prabandham-the-most-valuable-gift-from-azhwars-tamil/ based on http://pillai.koyil.org/index.php/2015/02/beginners-guide-dhivya-prabandham-the-most-valuable-gift-from-azhwars/ – thamizh translation by geethA ammangar as part of Beginner’s guide (ஸ்ரீவைஷ்ணவம் – பால பாடம்) – http://pillai.koyil.org/index.php/beginners-guide-tamil/ based on http://pillai.koyil.org/index.php/beginners-guide/ . thiruvAimozhi 3.7.1 – payilum sudaroLi – http://divyaprabandham.koyil.org/index.php/2016/09/thiruvaimozhi-3-7-1-payilum-sudaroli/ – English translation. Full series can be viewed at http://divyaprabandham.koyil.org/index.php/thiruvaimozhi/ . thirumAlai – pAsuram 19 – http://divyaprabandham.koyil.org/index.php/2016/09/thirumalai-19/ – English translation by T N krishNan swamy. Full series can be viewed at http://divyaprabandham.koyil.org/index.php/2016/07/thirumalai/ . Arththi prabandham – pAsuram 26 – http://divyaprabandham.koyil.org/index.php/2016/09/arththi-prabandham-26/ – English translation by santhAnam swamy. Full series can be viewed at – http://divyaprabandham.koyil.org/index.php/2016/05/arththi-prabandham/ . SrIperumbUthUr – purattAsi pUsam (yesterday) – http://sriperumbuthur.blogspot.com/2016/09/september-2016-week-5.html . thiruvallikkENi – punarpUsam – SrI rAma parivAr puRappAdu (day before yesterday) – http://thiruvallikkeni.koyil.org/?p=478 . e-book for 1st chapter (simple version) link available at http://githa.koyil.org/index.php/e-books/ . Thanks to parAsara (pradeep) swamy for preparing the same. 3rd chapter – SlOkams 29 and 30 added in http://githa.koyil.org/index.php/3/ based on http://githa.koyil.org/index.php/3-original/ . guru paramaparai – periyavAchchAn piLLai – life and glories in thamizh – https://guruparamparaitamil.wordpress.com/2016/09/26/periyavachan-pillai/ based on https://guruparamparai.wordpress.com/2013/10/05/periyavachan-pillai/ – new article by ANdAL ammangar . Please visit https://guruparamparaitamil.wordpress.com/2015/03/14/introduction-2/ to see the full list. dhivya prabandham – Commencement of thiruvAimozhi 3.7 decad – payilum – http://divyaprabandham.koyil.org/index.php/2016/09/thiruvaimozhi-3-7-payilum/ – English translation. Full series can be viewed at http://divyaprabandham.koyil.org/index.php/thiruvaimozhi/ . SrIperumbUthUr – purattAsi punarpUsam (yesterday) – http://sriperumbuthur.blogspot.com/2016/09/september-2016-week-4.html . thiruvallikkENi – purattAsi saturday 2 (day before yesterday) – http://thiruvallikkeni.koyil.org/?p=478 . SrI bhagavath gIthA – 3rd chapter – SlOkams 27 and 28 added in http://githa.koyil.org/index.php/3/ based on http://githa.koyil.org/index.php/3-original/ . 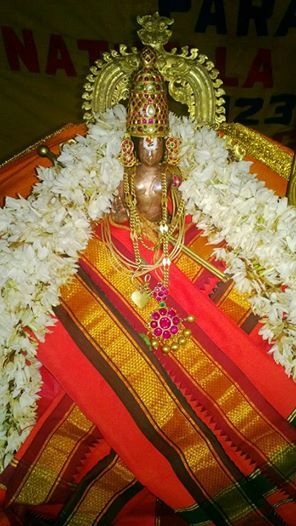 thirunakshathram today – kanni (purattAsi) punarpUsam – ponnadikkAl jIyar (vAnamAmalai/thOthAdhri mutt 1st jIyar) – http://acharyas.koyil.org/index.php/ponnadikkal-jiyar/ . SrIperumbUthUr – purattAsi thiruvAdhirai (yesterday) – http://sriperumbuthur.blogspot.com/2016/09/september-2016-week-4.html . SrI bhagavath gIthA – 3rd chapter – SlOkams 25 and 26 added in http://githa.koyil.org/index.php/3/ based on http://githa.koyil.org/index.php/3-original/ . dhivya prabandham – thirumAlai – pAsuram 18 – http://divyaprabandham.koyil.org/index.php/2016/09/thirumalai-18/ – English translation by T N krishNan swamy. Full series can be viewed at http://divyaprabandham.koyil.org/index.php/2016/07/thirumalai/ . This entry was posted in Uncategorized on September 24, 2016 by Sarathy Thothathri. SrIperumbUthUr – purattAsi mrgaSIrsham – SrI maNNaLandha perumAL, piLLai lOkAchAryar, mAmunigaL – bAlAlayam day 3 – completion (yesterday) – http://sriperumbuthur.blogspot.com/2016/09/september-2016-week-4.html . SrI bhagavath gIthA – 3rd chapter – SlOkams 23 and 24 added in http://githa.koyil.org/index.php/3/ based on http://githa.koyil.org/index.php/3-original/ . thiruvAimozhi 3.6.11 – kaNgaL kANdaRku – http://divyaprabandham.koyil.org/index.php/2016/09/thiruvaimozhi-3-6-11-kangal-kandarku/ – English translation. Full series can be viewed at http://divyaprabandham.koyil.org/index.php/thiruvaimozhi/ . thirumAlai – pAsuram 17 – http://divyaprabandham.koyil.org/index.php/2016/09/thirumalai-17/ – English translation by T N krishNan swamy. Full series can be viewed at http://divyaprabandham.koyil.org/index.php/2016/07/thirumalai/ . Arththi prabandham – pAsuram 25 – http://divyaprabandham.koyil.org/index.php/2016/09/arththi-prabandham-25/ – English translation by santhAnam swamy. Full series can be viewed at – http://divyaprabandham.koyil.org/index.php/2016/05/arththi-prabandham/ . SrIperumbUthUr – purattAsi rOhiNi – SrI maNNaLandha perumAL, piLLai lOkAchAryar, mAmunigaL – bAlAlayam day 2 (yesterday) – http://sriperumbuthur.blogspot.com/2016/09/september-2016-week-4.html . SrI bhagavath gIthA – 3rd chapter – SlOkam 22 added in http://githa.koyil.org/index.php/3/ based on http://githa.koyil.org/index.php/3-original/ . thiruvAimozhi 3.6.10 – kadal vaNNan – http://divyaprabandham.koyil.org/index.php/2016/09/thiruvaimozhi-3-6-10-kadal-vannan/ – English translation. Full series can be viewed at http://divyaprabandham.koyil.org/index.php/thiruvaimozhi/ . rAmAnusa nURRanthAdhi pAsuram 53 – http://divyaprabandham.koyil.org/index.php/2016/09/ramanusa-nurranthadhi-53/ – English translation by raghurAm swamy. Full series can be viewed at http://divyaprabandham.koyil.org/index.php/2015/07/ramanusa-nurranthadhi/ . yathirAja vimSathi – First 4 SlOkams uploaded at http://divyaprabandham.koyil.org/index.php/2016/07/yathiraja-vimsathi-telugu/ – telugu translation by chUdAmNi ammangar . Arththi prabandham – thaniyans – http://divyaprabandham.koyil.org/index.php/2016/09/arththi-prabandham-telugu-thaniyans/ based on http://divyaprabandham.koyil.org/index.php/2016/06/arththi-prabandham-thaniyans/ – translation by vaishNavi ammangar. Full series available at http://divyaprabandham.koyil.org/index.php/2016/09/arththi-prabandham-telugu/ . SrIperumbUthUr – purattAsi kArthigai – SrI maNNaLandha perumAL, piLLai lOkAchAryar, mAmunigaL – bAlAlayam day 1 (yesterday) – http://sriperumbuthur.blogspot.com/2016/09/september-2016-week-4.html . SrI bhagavath gIthA – 3rd chapter – SlOkams 17 to 21 added in http://githa.koyil.org/index.php/3/ based on http://githa.koyil.org/index.php/3-original/ . guru paramaparai – Srutha prakASikA bhattar – life and glories in thamizh – https://guruparamparaitamil.wordpress.com/2016/09/21/srutha-prakasika-bhattar/ based on http://guruparamparai.wordpress.com/2013/04/16/srutha-prakasika-bhattar/ – new article by ANdAL ammangar . Please visit https://guruparamparaitamil.wordpress.com/2015/03/14/introduction-2/ to see the full list. thiruvAimozhi 3.6.9 – thanjam Agiya – http://divyaprabandham.koyil.org/index.php/2016/09/thiruvaimozhi-3-6-9-thanjam-agiya/ – English translation. Full series can be viewed at http://divyaprabandham.koyil.org/index.php/thiruvaimozhi/ . SaraNAgathi gadhyam – chUrNikAs 2 to 4 – http://divyaprabandham.koyil.org/index.php/2016/09/saranagathi-gadhyam-hindi-2-to-4/ based on http://divyaprabandham.koyil.org/index.php/2015/12/saranagathi-gadhyam-2-to-4/ – Hindi translation by bhagavathi ammangar. Full series can be viewed at http://divyaprabandham.koyil.org/index.php/2016/08/saranagathi-gadhyam-hindi/ . SrIperumbUthUr – purattAsi bharaNi (yesterday) – http://sriperumbuthur.blogspot.com/2016/09/september-2016-week-4.html . SrIvaishNava Education/Kids Portal – thirumangai AzhwAr – http://pillai.koyil.org/index.php/2016/09/beginners-guide-thirumangai-azhwar-tamil/ based on http://pillai.koyil.org/index.php/2015/02/beginners-guide-thirumangai-azhwar/ – thamizh translation by geethA ammangar as part of Beginner’s guide (ஸ்ரீவைஷ்ணவம் – பால பாடம்) – http://pillai.koyil.org/index.php/beginners-guide-tamil/ based on http://pillai.koyil.org/index.php/beginners-guide/ . thiruvAimozhi 3.6.8 – thuyaramE tharu – http://divyaprabandham.koyil.org/index.php/2016/09/thiruvaimozhi-3-6-8-thuyarame-tharu/ – English translation. Full series can be viewed at http://divyaprabandham.koyil.org/index.php/thiruvaimozhi/ . uththara dhinacharyA – thamizh translation – first 5 SlOkams uploaded at http://divyaprabandham.koyil.org/index.php/2015/05/sri-varavaramuni-dhinacharya-tamil/. Uploaded by vEnkatEsh swamy. SrIperumbUthUr – purattAsi aSwini (yesterday) – http://sriperumbuthur.blogspot.com/2016/09/september-2016-week-4.html . thiruvAimozhi 3.4 – English e-book link available at http://divyaprabandham.koyil.org/index.php/2016/07/thiruvaimozhi-3rd-centum/ and http://divyaprabandham.koyil.org/index.php/e-books/ . Thanks to parAsara (pradeep) swamy for preparing the e-book. thiruvAimozhi 3.6.7 – ezhumaikkum – http://divyaprabandham.koyil.org/index.php/2016/09/thiruvaimozhi-3-6-7-ezhumaikkum/ – English translation. Full series can be viewed at http://divyaprabandham.koyil.org/index.php/thiruvaimozhi/ . thirumAlai – pAsuram 16 – http://divyaprabandham.koyil.org/index.php/2016/09/thirumalai-16/ – English translation by T N krishNan swamy. Full series can be viewed at http://divyaprabandham.koyil.org/index.php/2016/07/thirumalai/ . uththara dhinacharyA – Hindi translation available at http://divyaprabandham.koyil.org/index.php/2015/05/sri-varavaramuni-dhinacharya-hindi/ based on http://divyaprabandham.koyil.org/index.php/2015/05/sri-varavaramuni-dhinacharya/ . Uploaded by T S lakshmi narasimhan swamy. SrIperumbUthUr – purattAsi rEvathi (yesterday) – http://sriperumbuthur.blogspot.com/2016/09/september-2016-week-4.html . vAnamAmalai – pavithrOthsavam day 6 (yesterday) – http://vanamamalai.koyil.org/?p=861 . https://guruparamparai.wordpress.com/2013/04/05/nadathur-ammal/ – new article by SrIvaramangA ammangar and santhAnakrishNan swamy dhampathi . Please visit https://guruparamparaitamil.wordpress.com/2015/03/14/introduction-2/ to see the full list. thiruvAimozhi 3.6.6 – thORRak kEdu – http://divyaprabandham.koyil.org/index.php/2016/09/thiruvaimozhi-3-6-6-thorrak-kedu/ – English translation. Full series can be viewed at http://divyaprabandham.koyil.org/index.php/thiruvaimozhi/ . – Hindi translation by bhagavathi ammangar. Full series can be viewed at http://divyaprabandham.koyil.org/index.php/2016/08/saranagathi-gadhyam-hindi/ . uththara dhinacharyA – SlOkams 13, 14 and conclusion – English translation available at http://divyaprabandham.koyil.org/index.php/2015/05/sri-varavaramuni-dhinacharya/ . Translated by sadagopan swamy. Uploaded by vEnkatEsh swamy. SrIperumbUthUr – purattAsi uthrattAdhi, pavithrOthsavam day 5 (yesterday) – http://sriperumbuthur.blogspot.com/2016/09/september-2016-week-3.html . SrIvillipuththUr – pavithrOthsavam day 5 (yesterday) – http://srivilliputhur.koyil.org/?p=546 . thiruvallikkENi – purattAsi saturday 1 (yesterday) – http://thiruvallikkeni.koyil.org/?p=478 . vAnamAmalai – pavithrOthsavam day 4 (day before yesterday) – http://vanamamalai.koyil.org/?p=861 . thiruvAimozhi 3.6.5 – thiriyum kARRu – http://divyaprabandham.koyil.org/index.php/2016/09/thiruvaimozhi-3-6-5-thiriyum-karru/ – English translation. Full series can be viewed at http://divyaprabandham.koyil.org/index.php/thiruvaimozhi/ . Arththi prabandham – pAsuram 24 – http://divyaprabandham.koyil.org/index.php/2016/09/arththi-prabandham-24/ – English translation by santhAnam swamy. Full series can be viewed at – http://divyaprabandham.koyil.org/index.php/2016/05/arththi-prabandham/ . Commencement of Arththi prabandham telugu translation – http://divyaprabandham.koyil.org/index.php/2016/09/arththi-prabandham-telugu/ based on http://divyaprabandham.koyil.org/index.php/2016/05/arththi-prabandham/ . Translation by vaishNavi ammangar. This entry was posted in Uncategorized on September 17, 2016 by Sarathy Thothathri. SrIperumbUthUr – AvaNi pUrattAdhi, pavithrOthsavam day 4 (yesterday) – http://sriperumbuthur.blogspot.com/2016/09/september-2016-week-3.html . vAnamAmalai – pavithrOthsavam day 3 (day before yesterday) – http://vanamamalai.koyil.org/?p=861 . SrI rAmAnuja dharSanam – e-magazine – September/AvaNi – english/thamizh Issue recently released and can be viewed at http://www.varavaramuni.com/home/sriramanuja-dharsanam-magazine/english and http://www.varavaramuni.com/home/sriramanuja-dharsanam-magazine/thamizh respectively. SrIvaishNava granthams – SrIvaishNava thiruvArAdhanam – Full listing of pAsurams/SlOkams – https://srivaishnavagranthamstelugu.wordpress.com/2016/09/11/srivaishnava-thiruvaradhanam-pramanams/ based on http://ponnadi.blogspot.in/2014/12/srivaishnava-thiruvaradhanam-pramanams.html – telugu translation (new article) by vaishNavi ammangar. thiruvAimozhi 3.6.4 – vaimmin nummanaththu – http://divyaprabandham.koyil.org/index.php/2016/09/thiruvaimozhi-3-6-4-vaimmin-nummanaththu/ – English translation. Full series can be viewed at http://divyaprabandham.koyil.org/index.php/thiruvaimozhi/ . thirumAlai – pAsuram 15 – http://divyaprabandham.koyil.org/index.php/2016/09/thirumalai-15/ – English translation by T N krishNan swamy. Full series can be viewed at http://divyaprabandham.koyil.org/index.php/2016/07/thirumalai/ . SrIperumbUthUr – AvaNi sathayam, pavithrOthsavam day 3 (yesterday) – http://sriperumbuthur.blogspot.com/2016/09/september-2016-week-3.html . SrIvillipuththUr – pavithrOthsavam day 3 (yesterday) – http://srivilliputhur.koyil.org/?p=546 . SrI bhagavath gIthA – 3rd chapter – SlOkams 12 to 16 added in http://githa.koyil.org/index.php/3/ based on http://githa.koyil.org/index.php/3-original/ . SrIvaishNava Education/Kids Portal – thiruppANAzhwAr – http://pillai.koyil.org/index.php/2016/09/beginners-guide-thiruppanazhwar-tamil/ based on http://pillai.koyil.org/index.php/2015/01/beginners-guide-thiruppanazhwar/ – thamizh translation by geethA ammangar as part of Beginner’s guide (ஸ்ரீவைஷ்ணவம் – பால பாடம்) – http://pillai.koyil.org/index.php/beginners-guide-tamil/ based on http://pillai.koyil.org/index.php/beginners-guide/ . dhivya prabandham – thiruvAimozhi 3.6.3 – paravi vAnavar Eththa – http://divyaprabandham.koyil.org/index.php/2016/09/thiruvaimozhi-3-6-3-paravi-vanavar-eththa/ – English translation. Full series can be viewed at http://divyaprabandham.koyil.org/index.php/thiruvaimozhi/ . SrIperumbUthUr – AvaNi avittam, pavithrOthsavam day 2 (yesterday) – http://sriperumbuthur.blogspot.com/2016/09/september-2016-week-3.html . SrIvillipuththUr – pavithrOthsavam days 1 and 2 (upto yesterday) – http://srivilliputhur.koyil.org/?p=546 . SrIvaishNava Education/Kids Portal – piLLai lOkAchAryar and nAyanAr – http://pillai.koyil.org/index.php/2016/09/beginners-guide-pillai-lokacharyar-and-nayanar/ – new article by jAnaki ammangar. Full series available at http://pillai.koyil.org/index.php/beginners-guide/ . thiruvAimozhi 3.6.2 – mUvar Agiya – http://divyaprabandham.koyil.org/index.php/2016/09/thiruvaimozhi-3-6-2-muvar-agiya/ – English translation. Full series can be viewed at http://divyaprabandham.koyil.org/index.php/thiruvaimozhi/ . Arththi prabandham – pAsuram 23 – http://divyaprabandham.koyil.org/index.php/2016/09/arththi-prabandham-23/ – English translation by santhAnam swamy. Full series can be viewed at – http://divyaprabandham.koyil.org/index.php/2016/05/arththi-prabandham/ . SrIperumbUthUr – AvaNi SravaNam, EkAdhaSi, pavithrOthsavam day 1 (yesterday) – http://sriperumbuthur.blogspot.com/2016/09/september-2016-week-3.html . vAnamAmalai – pavithrOthsavam day 1 (yesterday) – http://vanamamalai.koyil.org/?p=861 . SrIvaishNava Education/Kids Portal – nampiLLai’s Sishyas – http://pillai.koyil.org/index.php/2016/09/beginners-guide-nampillais-sishyas/ – new article by jAnaki ammangar. Full series available at http://pillai.koyil.org/index.php/beginners-guide/ . thiruvAimozhi 3.6.1 – seyya thAmarai – http://divyaprabandham.koyil.org/index.php/2016/09/thiruvaimozhi-3-6-1-seyya-thamarai/ – English translation. Full series can be viewed at http://divyaprabandham.koyil.org/index.php/thiruvaimozhi/ . thirumAlai – pAsuram 14 – http://divyaprabandham.koyil.org/index.php/2016/09/thirumalai-14/ – English translation by T N krishNan swamy. Full series can be viewed at http://divyaprabandham.koyil.org/index.php/2016/07/thirumalai/ . SrIperumbUthUr – AvaNi uthrAdam (yesterday) – http://sriperumbuthur.blogspot.com/2016/09/september-2016-week-3.html . SrI bhagavath gIthA – 3rd chapter – SlOkam 11 added in http://githa.koyil.org/index.php/3/ based on http://githa.koyil.org/index.php/3-original/ . SrIvaishNava Education/Kids Portal – thoNdaradippodi AzhwAr – http://pillai.koyil.org/index.php/2016/09/beginners-guide-thondaradippodi-azhwar-tamil/ based on http://pillai.koyil.org/index.php/2014/12/beginners-guide-thondaradippodi-azhwar/ – thamizh translation by geethA ammangar as part of Beginner’s guide (ஸ்ரீவைஷ்ணவம் – பால பாடம்) – http://pillai.koyil.org/index.php/beginners-guide-tamil/ based on http://pillai.koyil.org/index.php/beginners-guide/ . dhivya prabandham – commencement of thiruvAimozhi 3.6 – seyya thAmarai – http://divyaprabandham.koyil.org/index.php/2016/09/thiruvaimozhi-3-6-seyya-thamarai/ – English translation. Full series can be viewed at http://divyaprabandham.koyil.org/index.php/thiruvaimozhi/ . SrIperumbUthUr – AvaNi pUrAdam (yesterday) – http://sriperumbuthur.blogspot.com/2016/09/september-2016-week-3.html . SrI bhagavath gIthA – 3rd chapter – SlOkams 9 and 10 added in http://githa.koyil.org/index.php/3/ based on http://githa.koyil.org/index.php/3-original/ . dhivya prabandham – thiruvAimozhi 3.5.11 – thIrndha adiyavar – http://divyaprabandham.koyil.org/index.php/2016/09/thiruvaimozhi-3-5-11-thirndha-adiyavar/ – English translation. Full series can be viewed at http://divyaprabandham.koyil.org/index.php/thiruvaimozhi/ . This entry was posted in Uncategorized on September 11, 2016 by Sarathy Thothathri. SrIperumbUthUr – Friday, AvaNi kEttai (yesterday) – http://sriperumbuthur.blogspot.com/2016/09/september-2016-week-2.html . SrIvaishNava Education/Kids Portal – ANdAL – http://pillai.koyil.org/index.php/2016/09/beginners-guide-andal-tamil/ based on http://pillai.koyil.org/index.php/2014/12/beginners-guide-andal/ – thamizh translation by geethA ammangar as part of Beginner’s guide (ஸ்ரீவைஷ்ணவம் – பால பாடம்) – http://pillai.koyil.org/index.php/beginners-guide-tamil/ based on http://pillai.koyil.org/index.php/beginners-guide/ . thiruvAimozhi 3.5.10 – karumamum – http://divyaprabandham.koyil.org/index.php/2016/09/thiruvaimozhi-3-5-10-karumamum/ – English translation. Full series can be viewed at http://divyaprabandham.koyil.org/index.php/thiruvaimozhi/ . thirumAlai – pAsuram 13 – http://divyaprabandham.koyil.org/index.php/2016/09/thirumalai-13/ – English translation by T N krishNan swamy. Full series can be viewed at http://divyaprabandham.koyil.org/index.php/2016/07/thirumalai/ . SrIperumbUthUr – AvaNi anusham (yesterday) – http://sriperumbuthur.blogspot.com/2016/09/september-2016-week-2.html . SrI bhagavath gIthA – 3rd chapter – SlOkams 7 and 8 added in http://githa.koyil.org/index.php/3/ based on http://githa.koyil.org/index.php/3-original/ . SrIvaishNava Education/Kids Portal – periyAzhwAr – http://pillai.koyil.org/index.php/2016/09/beginners-guide-periyazhwar-tamil/ based on http://pillai.koyil.org/index.php/2014/11/beginners-guide-periyazhwar/ – thamizh translation by geethA ammangar as part of Beginner’s guide (ஸ்ரீவைஷ்ணவம் – பால பாடம்) – http://pillai.koyil.org/index.php/beginners-guide-tamil/ based on http://pillai.koyil.org/index.php/beginners-guide/ . dhivya prabandham – thiruvAimozhi 3.5.9 – amarar thozhappaduvAnai – http://divyaprabandham.koyil.org/index.php/2016/09/thiruvaimozhi-3-5-9-amarar-thozhappaduvanai/ – English translation. Full series can be viewed at http://divyaprabandham.koyil.org/index.php/thiruvaimozhi/ . SrIperumbUthUr – AvaNi visAgam (yesterday) – http://sriperumbuthur.blogspot.com/2016/09/september-2016-week-2.html . thiruvallikkENi – AvaNi swAthi (day before yesterday) – http://thiruvallikkeni.koyil.org/?p=478 . SrI bhagavath gIthA – 3rd chapter – SlOkams 5 and 6 added in http://githa.koyil.org/index.php/3/ based on http://githa.koyil.org/index.php/3-original/ . SrIvaishNava Education/Kids Portal – kulaSEkara AzhwAr – http://pillai.koyil.org/index.php/2016/09/beginners-guide-kulasekarazhwar-tamil/ based on http://pillai.koyil.org/index.php/2014/11/beginners-guide-kulasekarazhwar/ – thamizh translation by geethA ammangar as part of Beginner’s guide (ஸ்ரீவைஷ்ணவம் – பால பாடம்) – http://pillai.koyil.org/index.php/beginners-guide-tamil/ based on http://pillai.koyil.org/index.php/beginners-guide/ . thiruvAimozhi 3.5.8 – vAr punal – http://divyaprabandham.koyil.org/index.php/2016/09/thiruvaimozhi-3-5-8-var-punal/ – English translation. Full series can be viewed at http://divyaprabandham.koyil.org/index.php/thiruvaimozhi/ . uththara dhinacharyA – SlOkams 7 to 12 – English translation available http://divyaprabandham.koyil.org/index.php/2015/05/sri-varavaramuni-dhinacharya/ . Translated by sadagopan swamy. Uploaded by vEnkatEsh swamy. AzhwArthirunagari – nammAzhwAr visits thirukkOLUr (yesterday) – http://azhwarthirunagari.koyil.org/?p=1057 . SrIperumbUthUr – AvaNi swAthi (yesterday) – http://sriperumbuthur.blogspot.com/2016/09/september-2016-week-2.html . thiruvAimozhi 3.5.7 – nIrmaiyil nURRuvar – http://divyaprabandham.koyil.org/index.php/2016/09/thiruvaimozhi-3-5-7-nirmaiyil-nurruvar/ – English translation. Full series can be viewed at http://divyaprabandham.koyil.org/index.php/thiruvaimozhi/ . thirumAlai – pAsuram 12 – http://divyaprabandham.koyil.org/index.php/2016/09/thirumalai-12/ – English translation by T N krishNan swamy. Full series can be viewed at http://divyaprabandham.koyil.org/index.php/2016/07/thirumalai/ . SrIperumbUthUr – AvaNi chithrai (yesterday) – http://sriperumbuthur.blogspot.com/2016/09/september-2016-week-2.html . thiruvallikkENi – AvaNi hastham (day before yesterday) – http://thiruvallikkeni.koyil.org/?p=478 . SrI vAnamAmalai mutt – scanned copy of most recently published thaniyans book uploaded and links are available at http://vanamamalai.us/index.php?option=com_content&view=article&id=318:mutt-downloads&catid=65:articles&Itemid=117 . gIthA – 3rd chapter – SlOkam 4 added in http://githa.koyil.org/index.php/3/ based on http://githa.koyil.org/index.php/3-original/ . thiruvAimozhi 3.5.6 – manisarum maRRum – http://divyaprabandham.koyil.org/index.php/2016/09/thiruvaimozhi-3-5-6-manisarum-marrum/ – English translation. Full series can be viewed at http://divyaprabandham.koyil.org/index.php/thiruvaimozhi/ . pUrva dhinacharyA – hindi translation – all SlOkams available at http://divyaprabandham.koyil.org/index.php/2015/05/sri-varavaramuni-dhinacharya-hindi/ . Uploaded by T S lakshmi narasimhan swamy. uththara dhinacharyA – SlOkams 1 to 6 – English translation available http://divyaprabandham.koyil.org/index.php/2015/05/sri-varavaramuni-dhinacharya/ . Translated by sadagopan swamy. Uploaded by vEnkatEsh swamy. kUram – AvaNi hastham (yesterday) – http://kuram.koyil.org/?p=487 . SrIperumbUthUr – AvaNi hastham (yesterday) – http://sriperumbuthur.blogspot.com/2016/09/september-2016-week-2.html . gIthA – 3rd chapter – SlOkam 3 added in http://githa.koyil.org/index.php/3/ based on http://githa.koyil.org/index.php/3-original/ . dhivya prabandham – thirumAlai – pAsuram 11 – http://divyaprabandham.koyil.org/index.php/2016/09/thirumalai-11/ – English translation by T N krishNan swamy. Full series can be viewed at http://divyaprabandham.koyil.org/index.php/2016/07/thirumalai/ . SrIperumbUthUr – AvaNi uthram (yesterday) – http://sriperumbuthur.blogspot.com/2016/09/september-2016-week-1.html . gIthA – e-books of bhagavath gIthA – Preface (original and simple version) uploaded at http://githa.koyil.org/index.php/e-books/ . Thanks to parAsara (pradeep) swamy for preparing the same. Audio recording of thiruvAimozhi 3.5 uploaded at http://divyaprabandham.koyil.org/index.php/2016/09/thiruvaimozhi-3-5-audio/ . thiruvAimozhi 3.5.5 – sAdhu sanththai – http://divyaprabandham.koyil.org/index.php/2016/09/thiruvaimozhi-3-5-5-sadhu-sanaththai/ – English translation. Full series can be viewed at http://divyaprabandham.koyil.org/index.php/thiruvaimozhi/ . rAmAnusa nURRanthAdhi pAsuram 52 – http://divyaprabandham.koyil.org/index.php/2016/09/ramanusa-nurranthadhi-52/ – English translation by raghurAm swamy. Full series can be viewed at http://divyaprabandham.koyil.org/index.php/2015/07/ramanusa-nurranthadhi/ . Arththi prabandham – pAsuram 22 – http://divyaprabandham.koyil.org/index.php/2016/09/arththi-prabandham-22/ – English translation by santhAnam swamy. Full series can be viewed at – http://divyaprabandham.koyil.org/index.php/2016/05/arththi-prabandham/ . This entry was posted in Uncategorized on September 3, 2016 by Sarathy Thothathri. SrIperumbUthUr – Friday, AvaNi pUram (yesterday) http://sriperumbuthur.blogspot.com/2016/09/september-2016-week-1.html . thiruvAimozhi 3.5.4 – vambavizh kOdhai – http://divyaprabandham.koyil.org/index.php/2016/09/thiruvaimozhi-3-5-4-vambavazhil-kodhai/ – English translation. Full series can be viewed at http://divyaprabandham.koyil.org/index.php/thiruvaimozhi/ . SaraNAgathi gadhyam – pravESam (Introduction) – http://divyaprabandham.koyil.org/index.php/2016/09/saranagathi-gadhyam-hindi-introduction/ based on http://divyaprabandham.koyil.org/index.php/2015/11/saranagathi-gadhyam-introduction/ – Hindi translation by bhagavathi ammangar. Full series can be viewed at http://divyaprabandham.koyil.org/index.php/2016/08/saranagathi-gadhyam-hindi/ . rAmAnusa nURRanthAdhi pAsuram 51 – http://divyaprabandham.koyil.org/index.php/2016/09/ramanusa-nurranthadhi-51/ – English translation by raghurAm swamy. Full series can be viewed at http://divyaprabandham.koyil.org/index.php/2015/07/ramanusa-nurranthadhi/ . SrIperumbUthUr – amAvAsyai, AvaNi magam (yesterday) – http://sriperumbuthur.blogspot.com/2016/09/september-2016-week-1.html . bhagavath gIthA – 3rd chapter – SlOkams 1 and 2 added in http://githa.koyil.org/index.php/3/ based on http://githa.koyil.org/index.php/3-original/ . thiruvAimozhi 3.5.3 – malaiyai eduththu – http://divyaprabandham.koyil.org/index.php/2016/09/thiruvaimozhi-3-5-3-malaiyai-eduththu/ – English translation. Full series can be viewed at http://divyaprabandham.koyil.org/index.php/thiruvaimozhi/ . thirumAlai – pAsuram 10 – http://divyaprabandham.koyil.org/index.php/2016/09/thirumalai-10/ – English translation by T N krishNan swamy. Full series can be viewed at http://divyaprabandham.koyil.org/index.php/2016/07/thirumalai/ . rAmAnusa nURRanthAdhi pAsuram 50 – http://divyaprabandham.koyil.org/index.php/2016/09/ramanusa-nurranthadhi-50/ – English translation by raghurAm swamy. Full series can be viewed at http://divyaprabandham.koyil.org/index.php/2015/07/ramanusa-nurranthadhi/ . SrIperumbUthUr – AvaNi Ayilyam (yesterday) – http://sriperumbuthur.blogspot.com/2016/08/august-2016-week-5.html . bhagavath gIthA – Commencement of 3rd chapter – http://githa.koyil.org/index.php/3/ based on http://githa.koyil.org/index.php/3-original/ . – thamizh translation by geethA ammangar as part of Beginner’s guide (ஸ்ரீவைஷ்ணவம் – பால பாடம்) – http://pillai.koyil.org/index.php/beginners-guide-tamil/ based on http://pillai.koyil.org/index.php/beginners-guide/ . dhivya prabandham – thiruvAimozhi 3.5.2 – thaN kadal – http://divyaprabandham.koyil.org/index.php/2016/08/thiruvaimozhi-3-5-2-than-kadal/ – English translation. Full series can be viewed at http://divyaprabandham.koyil.org/index.php/thiruvaimozhi/ . This entry was posted in Uncategorized on September 1, 2016 by Sarathy Thothathri.